I’m sitting here staring at my monitor trying my damnedest to fathom what I could possibly tell you about this book that would do it justice. The Secret History is a story about a group of above average intelligence college students who are studying with an elitist professor who requires their full attention as he monopolizes their time with lectures and insight into human behavior and more importantly, the Greek language, its origins and history. It was not until I finished this book that I came to the realization of just how important this passage is. Ironic, isn’t it? Page 41 out of 559, my favorite passage of this book and in the end it brings the entire story together. I wonder, if you will understand its meaning. Richard is the lucky soul to tell the story. I’ve been sitting here attempting to give you insight to each character. The progression is so extremely profound that I 1) could never do them justice and 2) am unable to do so without giving away what will surely be some of the most intriguing characters you will ever read. The character progression in this story is by far one of the most incredible I have ever had the pleasure of experiencing. I will quote a few passages and be done with it. The sky was fierce, burning blue, the trees ferocious shades of red and yellow. Francis, barefoot and still in his bathrobe, stepped precariously over rocks and branches, balancing in his glass of ginger ale. Once we got to the lake he waded in, up to his knees, and beckoned dramatically like Saint John the Baptist. We took off our shoes and socks. The water near the bank was clear, pale green, cool over my ankles, and the pebbles at the bottom were dappled with sunlight. Henry, in coat and tie, waded out to where Francis stood, his trousers rolled to the knee, an old-fashioned banker in a surrealistic painting. A wind rustled through the birches, blowing up the pale undersides of the leaves, and it caught in Camilla’s dress and billowed it out like a white balloon. She laughed, and smoothed it down quickly, only to have it blow out again. This is a heart-wrenching story of six friends suffering from trauma, betrayal, unworldly experimentations, lies, deceit, genius schemes with an absolute unsurpassed brilliance! With all of that said, the character progression, the relationships alone make this book a MUST READ. For those of you without an active thinking brain, I suggest you purchase a pocket dictionary, otherwise you will be unable to appreciate the complexity of the story. I will never read this book again. Regardless of the brilliant characters, I found myself struggling, suffering, dry-eyed blinking my way through the pages as if I was running down the Poltergeist hallway which led me forward to an unreachable destination. I finished the book this morning, plopped it roughly down onto the couch and took a deep, relieved breath. Done! I recommend this book to teenagers and adults. I do not recommend this book to younger eyes due to the sheer trauma that even the reader will experience. Children do not need to let their minds live through what these characters endure. 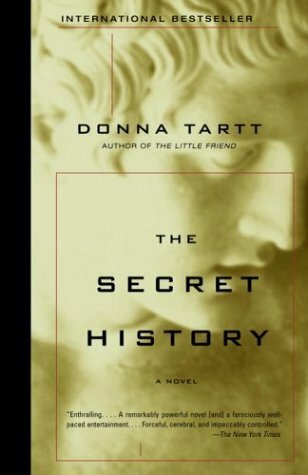 This entry was posted in Reviews and tagged Book, book review, Donna Tartt, greek language, review, secret history, The Secret History. Bookmark the permalink. I’m glad to know that I wasn’t the only one who struggled with this. I read it a couple of years ago and I remember it taking a while to get through, but it redeems itself with how powerful the story is. Exactly … 🙂 Do you have a favorite character?